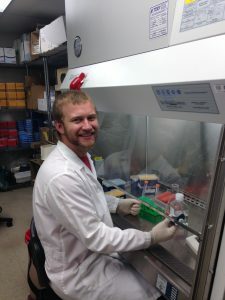 Adam working in the lab at Colorado State University. Every cell in your body contains the same DNA. How is it that genetically identical skin, brain, and muscle cells can look very different and perform very different functions from each other? Cells differentiate, or become different from one another, by turning certain genes on and off. This process is called gene expression. For example, when you spend time in the sun your skin cells turn on the gene for pigment, which protects your cells from bright sunlight. In the winter when there is less sunlight, your cells turn off this gene. This process your body uses to turn genes on and off is the same one it uses to develop from one cell into the many different cell types that make up your body. Stem cells have the ability to turn into any other type of cell in the body, an ability known as pluripotency. Your body retains some stem cells for your entire life. Some genes are only turned on in specific types of cells because they have specialized jobs for those cell types, like muscle or brain cells. Other genes are more like managers, controlling which genes are turned on and off. The activity of these manager genes may be more common in stem cells because they could control which type of cell the stem cell will become. In recent years, scientists discovered they could reprogram specialized cells back into non-specialized stem cells, simply by turning on several manager genes. They call these reprogrammed cells induced pluripotent, or iPS. Adam working under the hood, reprogramming specialized cells into induced pluripotent stem cells for his experiments. Adam was working as a biologist in Colorado when he learned that many cool medical advances in regenerative and personalized medicine will happen when we figure out which genes are turned on, and which are turned off, in pluripotent stem cells. In his research, Adam wanted to look at gene expression for two genetically identical cell lines, those that have specialized and those that have been reprogrammed to be iPS stem cells. He was interested to see which genes are expressed by both types of cells and which genes are only expressed in one type of cell. He decided to work with fibroblast cells because they are easy to grow in the lab. Fibroblasts cells are mainly responsible for production and maintenance of the extracellular matrix (including joints, ligaments, tendons and connective tissues), which is critical in holding the body’s tissues together. 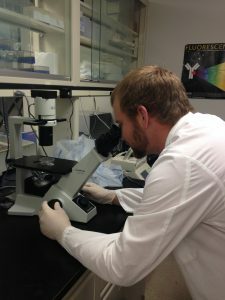 From reading the work of other scientists, Adam learned how to transform fibroblast cells into iPS stem cells. This knowledge lead him to two genetically identical types of cells – (1) specialized fibroblast cells and (2) unspecialized iPS cells. When fibroblast cells are transformed into unspecialized iPS cells, their function changes and they become responsible for wound healing and generating new tissues, acting like a reserve set of cells. Because fibroblast and iPS cells perform very different functions, Adam thinks it is likely that each cell line will expresses genes that are specific to its individual function. Adam looked at expression in 10 different genes that are thought to have important functions for fibroblast or iPS cells. Adam measured the expression for each gene by looking at RNA abundance of each gene in the different cell types. RNA is the intermediate between DNA (the genetic blueprint) and protein (the functional worker of the cell). Adam chose to look at RNA, because it is often representative of how much protein is present in a cell, which is very difficult to measure directly. Adam analyzed three replicates for each cell type. He replicated in order to get a more accurate representation for each cell type. This is important in case the samples were in slightly different conditions, like warmer or cooler temperatures, which could alter gene expression. This experiment allowed Adam to figure out which genes are turned on in iPS cells, allowing him to better understand how stem cells work. 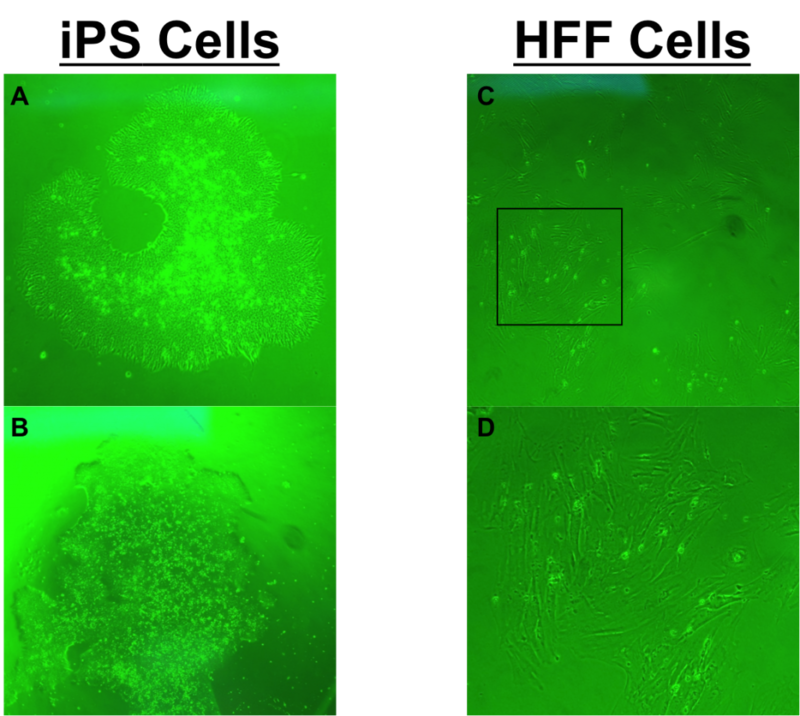 iPS cells display different gene expression and physical appearance than HFF cells: Figures A and B are low magnification images of two different iPS cell colonies. iPS cells are usually small, round, and like to grow in circular-like colonies. Figures C is a low magnification image of HFF cells. HFF cells tend to appear long and slender almost like trees. Generally, HFF cells like to grow near each other, but not in colonies. Figure D is a higher magnification image of the black box in figure C, showing a group of HFF cells growing in close proximity with each other. Featured scientist: Adam Heck from Colorado State University. 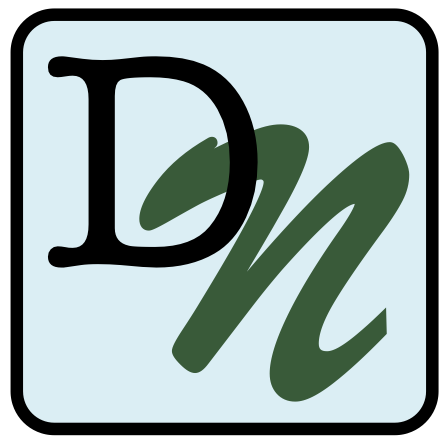 Written with Sandra Weeks from the Poudre Valley School District. To learn more about the researching being done in Adam’s lab, click here. Neff, A. T., Lee, J. Y., Wilusz, J., Tian, B., & Wilusz, C. J. (2012). Global analysis reveals multiple pathways for unique regulation of mRNA decay in induced pluripotent stem cells. Genome Research, 22(8), 1457–1467.